The fifth leg of the PETRONAS AAM Malaysian Cub Prix Championship marked a difficult outing for the Yamaha camp as neither of it’s riders managed a podium finish in the premiere CP130 category in Teluk Intan, Perak today. A hard race, spectators who were present witnessed history in the making as teammates Norizman Ismail, Azlan Shah Kamaruzaman, Mohd Fitri Ashraf Razali and Affendi Rosli finish the 15 lap race in top four spots. 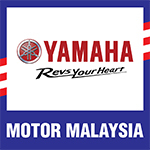 The last team to ever achieve similar success was Yamaha Maju Motor Racing riders through former riders, Ahmad Fazli Sham, Ahmad Fazrul Sham and Mohd Faiz Nawawi back in 2008. 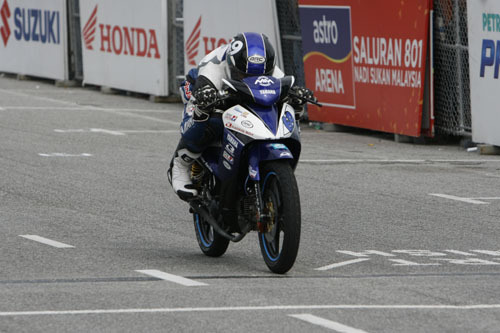 Current Yamaha Maju Motor Racing rider, Mohd Taufiq Roslan completed the race in sixth place within 14’48.631s followed by PETRONAS Syntium Moto Yamaha Raceline’s Zamri Baba seventh, 14’48.986s. Meanwhile, Mohd Ramdan Mohd Rosli and Zulsyafiz Rosli of PETRONAS Syntium Moto Yamaha AHM and Zamri’s teammate Mohd Ilham Kamal DNF the race. In the CP115, Apido Yamaha Boon Kui rider, Ahmad Abdul Kadir put up a good fight to finish the race in second place behind winner, Mohd Amirul Ariff Musa. The Sarawakian completed the intense race within 11’68.823s followed by defending Champion, Shahril Izzuwan Mohd Noor (PETRONAS Syntium Moto Yamaha AHM) third, 12’01.269s. Meanwhile, Amirul celebrates his win with a total time of 11’68.338s. In the age-cap Wira class, Tengku Amirul Haffiruddin did the Yamaha contingent proud to keep up with dominant, Fakhrusy Syakirin Rostam. The Motul Yamaha YY Pang rider successfully completed the 10 lap race in second place with 9’59.002s, 1.947 seconds behind Fakhrusy who championed with 9’57.066s. Third came in Khairul Idham Pawi with 10’08.681s. Lastly, Mohd Izzat Zaidi was proudly nominated winner for the fifth round of the Yamaha 135 Super Series PETRONAS. Earning a good holeshot at the start, Izzat flared the high speed track with such style he rarely gave anyone a chance to touch him. Invincible as he is, he took the victory in 10:20.845s. A one-two finish, good friend Tengku Amirul Haffiruddin cleaned his sheet with a good end in second place while Mohd Izrul Huzairie Amran finished third.